Would you like to work for a family-owned company and a dynamic group with more than 30 Falkensteiner Hotels & Residences in Europe? Would you prefer a Welcome Home! feeling instead of a sterile working environment? Would you like to actively participate instead of just trying to keep up? Would you like to set you sights high instead of not making any progress? 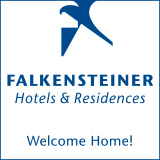 Then you are the right person for Falkensteiner Hotels & Residences!